The dsp.DyadicAnalysisFilterBank System object™ decomposes a broadband signal into a collection of subbands with smaller bandwidths and slower sample rates. The System object uses a series of highpass and lowpass FIR filters to provide approximate octave band frequency decompositions of the input. Each filter output is downsampled by a factor of two. With the appropriate analysis filters and tree structure, the dyadic analysis filter bank is a discrete wavelet transform (DWT) or discrete wavelet packet transform (DWPT). Create the dsp.DyadicAnalysisFilterBank object and set its properties. dydan = dsp.DyadicAnalysisFilterBank constructs a dyadic analysis filter bank object, dydan, that computes the level-two discrete wavelet transform (DWT) of a column vector input. For a 2-D matrix input, the object transforms the columns using the Daubechies third-order extremal phase wavelet. The length of the input along the first dimension must be a multiple of 4.
dydan = dsp.DyadicAnalysisFilterBank(Name,Value) returns a dyadic analysis filter bank object, with each property set to the specified value. Specify a vector of lowpass FIR filter coefficients, in powers of z-1. Use a half-band filter that passes the frequency band stopped by the filter specified in the CustomHighpassFilter property. The default specifies a Daubechies third-order extremal phase scaling (lowpass) filter. This property applies when you set the Filter property to Custom. Specify a vector of highpass FIR filter coefficients, in powers of z-1. Use a half-band filter that passes the frequency band stopped by the filter specified in the CustomLowpassFilter property. The default specifies a Daubechies 3rd-order extremal phase wavelet (highpass) filter. Specify the order of the wavelet selected in the Filter property. This property applies when you set the Filter property to an orthogonal wavelet: Daubechies (Daubechies extremal phase), Symlets (Daubechies least-asymmetric), or Coiflets. Specify the order of the analysis and synthesis filter orders for biorthogonal filter banks as 1 / 1, 1 / 3, 1 / 5, 2 / 2, 2 / 4, 2 / 6, 2 / 8, 3 / 1, 3 / 3, 3 / 5, 3 / 7, 3 / 9, 4 / 4, 5 / 5, or 6 / 8. Unlike orthogonal wavelets, biorthogonal wavelets require different filters for the analysis (decomposition) and synthesis (reconstruction) of an input. The first number indicates the order of the synthesis (reconstruction) filter. The second number indicates the order of the analysis (decomposition) filter. This property applies when you set the Filter property to Biorthogonal or Reverse Biorthogonal. Specify the number of filter bank analysis levels a positive integer greater than or equal to 1. A level-N asymmetric structure produces N+1 output subbands. A level-N symmetric structure produces 2N output subbands. The size of the input along the first dimension must be a multiple of 2N, where N is the number of levels. Specify the structure of the filter bank as Asymmetric or Symmetric. The asymmetric structure decomposes only the lowpass filter output from each level. The symmetric structure decomposes the highpass and lowpass filter outputs from each level. If the analysis filters are scaling (lowpass) and wavelet (highpass) filters, the asymmetric structure is the discrete wavelet transform, while the symmetric structure is the discrete wavelet packet transform. y = dydan(x) computes the subband decomposition of the input x and outputs the dyadic subband decomposition in y as a single concatenated column vector or matrix of coefficients. Data input, specified as a column vector or a matrix. Each column of x is treated as an independent input, and the number of rows of x must be a multiple of 2N, where N is the number of levels specified by the NumLevels property. Dyadic subband decomposition output, returned as a column vector or a matrix. The elements of y are ordered with the highest-frequency subband first followed by subbands in decreasing frequency. Denoise square wave input using dyadic analysis and synthesis filter banks. The filter coefficients correspond to a haar wavelet. Set higher frequency coefficients to zero to remove the noise. 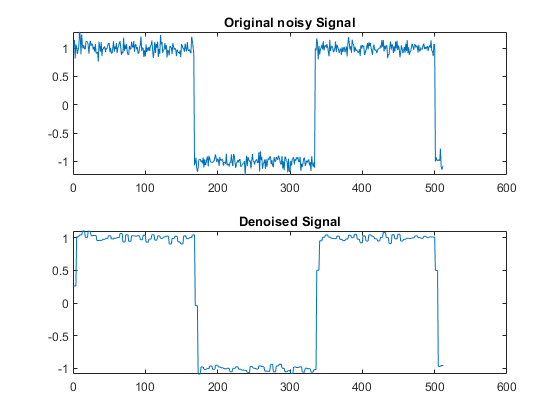 Plot the original and denoised signals. Sampling frequency 1 kHz input length 1024. The dyadic analysis filter bank object always concatenates the subbands into a single column vector for a column vector input, or into the columns of a matrix for a matrix input. This behavior corresponds to the block's behavior when you set the Output parameter to Single port.